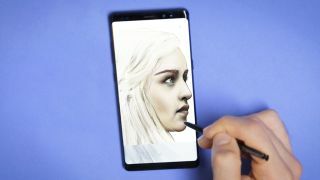 Courtesy of our friends at TechRadar we've got news for you on upcoming phones from Samsung, Apple and Google, plus a prediction about the 2018 World Cup from FIFA 18, and some high-tech gadgetry that's helping London's street performers boost their income. Samsung should unveil the Galaxy Note 9 in the next couple of months, and thanks to a leaked screen protector design, we now know a little bit more about how it's going to look (thank you, accessory makers). It doesn't look like the design is going to get too many changes, though once again the bezels appear to have shrunk to offer more screen space. As part of an initiative from the Mayor of London's office and payments system iZettle, London buskers are now able to sign up to receive cashless payments while performing out on the streets. As well as throwing some change into a guitar case, passers-by can swipe a contactless card (or any similar NFC-enabled payment device) to leave a tip. According to Deutsche Securities analyst Jialin Lu, one of the 2019 iPhones is set to get not two but three lenses on the back, all combining to make a rear-facing camera that can sense depth, perform a variety of augmented reality tricks, and more. We've still got more than a year to wait to find out if he's right, but the 2018 iPhones will arrive in September. EA Sports has run a simulation of this summer's soccer World Cup in its FIFA 2018 game, crunching the masses of data it holds on players and teams, and has declared that France are likely to be the eventual winners. France will beat Germany in the final, the video game predicts, with France's Antoine Griezmann tying with Spain's Isco for the top scorer. We're not sure on the source, but an image of a couple of screen protectors has leaked out on the web, supposedly showing covers for the upcoming Pixel 3 and Pixel 3 XL from Google. Perhaps of most interest is that only the larger, XL model has a distinctive notch cut-out in the display – a feature that's going to be supported in this year's Android P.